Before I get into breakfast, let me recap my day 1 experience in our Vegan & Gluten Free Challenge. I have to admit I love the excited feeling I have of experimenting with new eats and testing things out in the kitchen. I had fun cooking away in the kitchen yesterday for sure. Foodwise, you know, I can’t say that I felt really any different. I was impressed with the fact that I was not starved at all (I had visions that eating just fruits/veggies would make me ravenous & a tad grouchy). I also thought it was interesting that I didn’t have any cravings for junkfood whatsoever ~ that is pretty cool for sure. Sodium was only 920 mg, for having a Thai meal that is awesome! 2 more thoughts then I am on to breakfast. 1. I know that in order to have any cholesterol in your day you have to have animal products, but, I guess I didn’t put two and two together. My cholesterol for yesterday was 0 which is beyond awesome! 2. I think I am learning that Gluten Free equals alot higher calories than just being Vegan. I think it is due to the options available for substitution maybe? I think I could have reduced the calories in the Pad Thai by using Shirataki Noodles or spagetti squash. Both would be great substitutions for alot less calories. I started my day off with a moderate interval run/walk on the treadmill that changes pace and grades every 30 seconds. Think of climbing up and down hills. It is the best way to wake up! 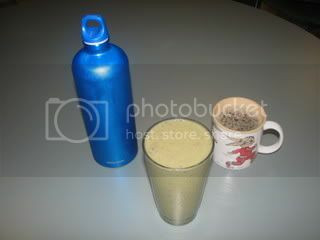 This morning for breakfast I decided to give my unsweetened lowfat soy milk a try by making a “Green Monster” smoothie. I have been intrigued by these smoothies after first seeing them on Oh She Glows. I used her idea as a base and in Danica style modified it to my liking. 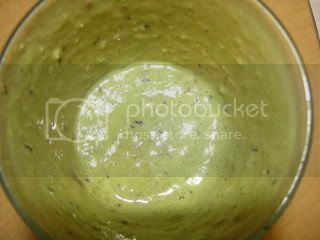 This was a cinch to make ~ I just tossed everything in my Magic Bullet & tadah! I have to say it was pretty darn tasty and you don’t even taste the spinach. The soy milk made it really thick and creamy along with the banana and the almond butter added the perfect toastiness ~ Yes, I made it through drinking it all and I think I might just like soy milk after all. Phew ~ that was a long post! Alright, I guess I need to get to working. Have a fantastic day all & be sure to check back at lunchtime for more. Looking good, D! I think I’m going to follow your lead and have a Green Monster for snack today. Green monster was a hit. To lower the calories I added 1c of Almond Breeze Vanilla Flavor and opt out the flax seed & almond butter. I made some for my boys. At first they were scared to try it and asked what is in it? I told them taste it first and if you like it, I will tell you what's in it. They finished every bit of it, when I told them what was in it they said I didn't even taste spinach. They say it taste just like a banana smoothie. I made one of them by adding strawberries, it turned brown. My son said it tasted just like the green one, but it looks bad. I recommend if you give it to kids opt out on the strawberries. Rachel ~ That is so cool that you got all 3 of your kids to try this. I never thought of that but what a great way to “sneak” in some healthy veggies. I bet they loved drinking a “Green Monster” because of the name too.